The Power of Love. Copper engraving  , probably taken from the first issue of The Musical Entertainer, published in fortnightly parts, from January 1737 to December 1739. This plate probably was engraved by "J. Champion Script. 1737" and later reprinted from the same plate in George Bickham, The Musical Entertainer, Vol, I, London 1740, p. 76. The engraving shows a musical party with a woman playing the baroque guitar. 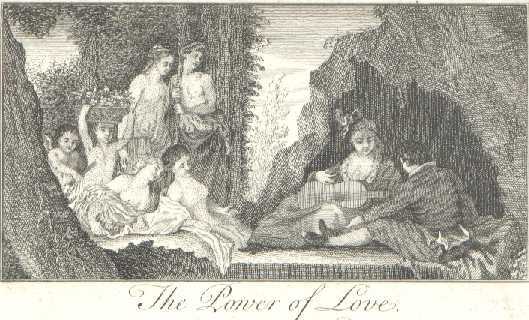 Below the picture is a song, "The Power of Love" / Set by a Gentleman of Oxford", with keyboard and flute accompaniment.